Forget about the shiny objects that people are offering as a bonus for Partnership to Success program! I’m going to be honest with you here. There is a bonus war going on for John Thorhill’s Partnership to Success program and people are fighting to give you as much as they can, including the kitchen sink! Well guess what? You don’t need it. Everything you need is in the program itself and the last thing you need is another shiny object to send you into info overload! So what do you need other than the Partnership to Success Program? Help and support and that is exactly what I’m offering here at Marketing From Scratch. I play an active part in John’s program which is more than I can say about some of the people promoting it and offering $1,000,000 bonuses of everything on their hard drive, all dressed up to look nice. Don’t be fooled you need help and support, the program itself has all you will ever need to make it, you don’t need more stuff. There are no magic bullets, pills or secret sauces of any kind! This is a guaranteed success program , so all you have to do is turn up and start. Think of it as an ‘easy’ work from home collage course with both John and myself as mentors to help you when you need it. Sound good? Ok you are ready for my bonus, but first of all please take a look at the video and I will show you how you can join in and become laser focused. 12 Months of Email Support – I guarantee you will need this at some point and I am here for you every step of the way, only an email away with your own personal email access to me. I have extensive knowledge of the course and marketing which will be a huge advantage to you. 3 Strategy Sessions – Sometimes you need to talk and I am here for you for 3 strategy sessions just as I explained in the video. I want to give you 3 hours of my time to help you make the most of Getting Started, Building Your Business and Moving Forward in your business. I normally charge $320 for 3 sessions with me, this is all in the bonus! $100 cash on course completion – We all need an incentive to complete any online course and as an added bonus I want to personally give you $100 for completing the course as a well done to you for being amazing! This is a legitimate $100 direct to your paypal account for completing and working your way to the end of the 12 month course. Any of My Products to Help You – I will make available to you my full product rage if you need it. 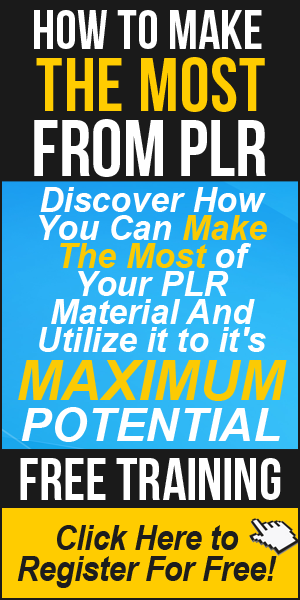 This includes all of my online training courses, blogging, PLR, eBook creation, Online Income Advisor, Product Development Control and more. But only if you need them! Remember what I said about focusing on the training and mentoring. Sales Funnel and Full Product Critique – During the your last strategy call, I will also let you know my feelings on your product and how we can improve it. I will look at your business before the call, so we don’t waste any time looking through your product during your strategy session. It’s all about you.. Product Promotion – John guarantees promotion of your completed product, so what’s better that to end your training with a promotion from me as well. This is a legitimate product promotion to add to the promotional sales which you will also receive from John. This bonus alone could make your investment back in a few days. I am at my best when I am teaching and training people to make money online. It’s what I do and I want to share it with you. My own training program was due for release this year but John made me a great offer to work with him and his students, an offer which I couldn’t refuse. So here I am waiting to work with you personally. This bonus is available for a very limited time only, and this page may be removed at anytime without notice. Order Partnership To success NOW, from the button or link below to claim your BONUS! In order to claim your bonuses, please send your Payment Receipt to the following address: bonus@dansumner.com with ‘Partnership to Success Bonus‘ in the subject. I would like to take a second to thank you for reading and your interest in this amazing partnership program. I do hope to be working with you very soon and making an income from online ventures. The Partnership to Success program really is a kick start program to start your own successful online business. Remember! You don’t need shiny objects just a couple of real mentors like John and myself. One of the best (if not THE best) offers I have seen for this training. Well hello Dan, just took you up on your bonus package. Look forward to working with John and making the most of your focussed bonus package, totally agree with your earlier reply about far too many bonus packages just being a random collection of marketers back catalogues with little relation to the actual product. Clearing the decks and getting ready to focus on one path of advice. Hey Igor, thanks for taking the bonus. I have seen your email and will reply shortly. Hi Dan ,Nice bonus and video. You do good work here. Like your new blog look.